This bariatric vitamins supplement is formulated specifically with the needs of post bariatric surgery members in mind. After surgery, the natural bodily absorption of calcium is affected. Therefore, supplementation of calcium becomes necessary to help maintain bone, teeth and heart health and wellbeing. Other than calcium, vitamin D and magnesium are also required to adequately absorb and utilise calcium. These ingredients are crucial in keeping healthy and help the prevention and treatment of osteoporosis and building strong, healthy bones, teeth. Calcium and vitamin D are also important to health operation of muscle contractions, body vital organs as well as the central nervous system. BN Multi has formulated this top quality Calcium and Vitamin D vitamin supplement. BN multi uses the most bio-available form of calcium – calcium citrate to ensure the highest level of absoption. 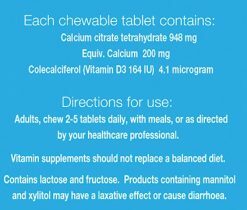 This vitamin D supplement is made in a smooth chocolate vanilla flavoured chewable tablet that tastes great. Vital supplement for post weight loss surgery to help meet calcium intake requirements. Help maintain strong bone health to assist in the prevention of osteoporosis. Important for the regulation of muscle contraction, including beating of heart muscles. Calcium is a key part to natural blood clotting. Highest bio-availability form of calcium in calcium citrate to ensure optimal absorption. 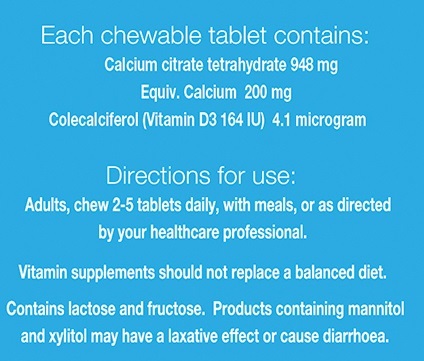 BN Advanced has recommended adults to take BN calcium chewable tablets 2-5 times daily with meals or as directed by your health care professional.